Finding new recipes to try is so much easier these days. Remember way back when, our source for new recipes was cookbooks and magazines? I also have pages and pages of handwritten recipes from my Grandma June that I’ve kept. Though I still enjoy finding recipes the “old fashioned” way, I’ve fully embraced technology and now have a whole new world of recipes at my fingertips! I could sit here all day and list out my favourite blogs and cooking sites. And don’t even get me started on Pinterest or we’ll be here all day. I’m a woman obsessed with 35,000 pins and counting! The one source of recipes I’ll always keep around is the word of mouth recipes. For instance, you are over at a friend’s place for dinner and they make the most amazing dessert and you just have to get the recipe! You write it on the back of old receipt in your purse so you can try at home. Then what? I personally don’t want to keep an old receipt or napkin and prefer to put the recipe on something clean and pretty! I was using index cards, but I’ve got a much nicer option now. And I’m sharing with you! I made this recipe card printable to use for your favourite recipes or ones shared by family and friends. I paste mine in a scrapbook, but you could also put them in index card holder. I would probably tape or glue it to an index card so it’s a little more sturdier. It’s a pdf download so it should be just a matter of downloading the pdf to your computer and clicking print. Print out as many as you like and feel free to share the link to this post with your recipe-loving friends! 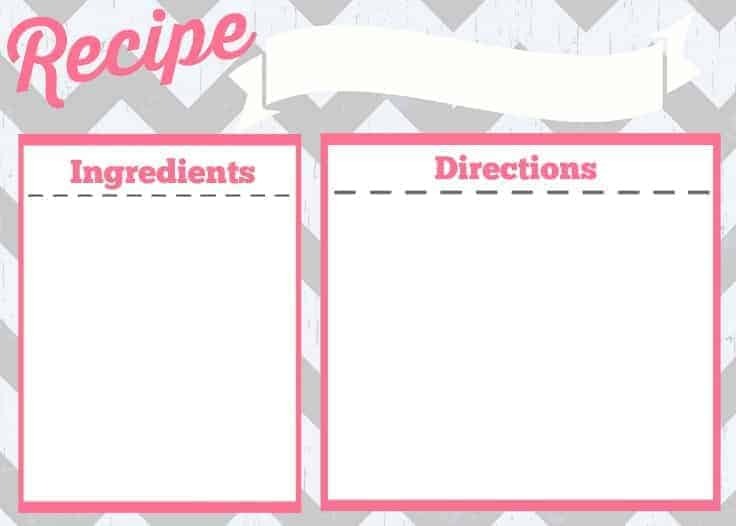 Fill out the form below to get your free recipe card printable. Great printable. I have multiple ways of storing my recipe – I have a data base file on the computer and others I have written out. These are really cute and they’d be even better if they were red and blue! 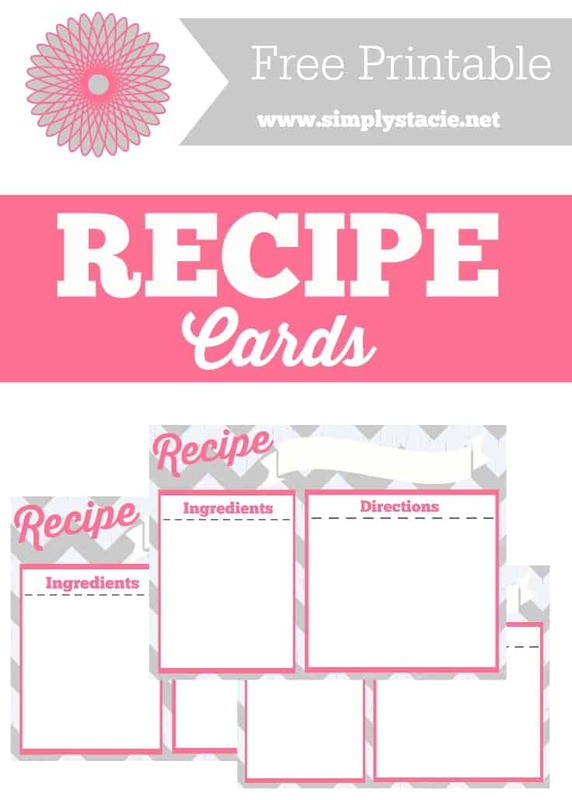 These are great recipe card ideas, nice for organizing all those important recipes. I do not store my recipes. I just have them in a binder and this would be a great way for me to put my all my favorite recipes. I have a recipe box that has cards in it. I need to get going and store my recipes with these neat cards!! I have typed all my favorite recipes, put an index page at the beginning of every section in a three ring binder. I put the recipes in top slide protectors. At the bottom of each recipe I told who gave it to me. It took almost a year to type. I gave copies to both of my kids and a few friends. I someday would love to have it published. These are great, I’m going to have to print some out for my mother, she has a bad habit of writing her recipes on scraps of paper and then she will lose it or toss it out, so these printables are perfect, thanks for sharing!! This is a great printable and you wouldn’t even have to use an index card if you buy heavy duty card stock and use it in your printer – I’ve done that for some other projects and it’s worked out really well. Thanks for the freebie! I have recipes stored on Pinterest, on my computer, in two recipe boxes, and in a binder. I have recipes saved on my computer, in a file and marked in my favourite cook books too. I have some of my grandmother’s recipes on card and the ink is fading. This would be great to transfer them to. Thanks. While cleaning out my mother’s house after her death, I learned that hand-written recipes cards had real value. I treasure each one from my mom, both grandmothers, various aunts and great aunts as well as those from women I don’t even know. They are threads in the tapestry of my life. The woman helping me clean out Mom’s house offered me study sum for the four boxes of recipes cards. I graciously declined her offer. I long for the day when I can sift thru these gems with my grandchildren, sharing past memories and making new ones. Thanks for such a cute style! Yes, I will be! Likely in November or December.